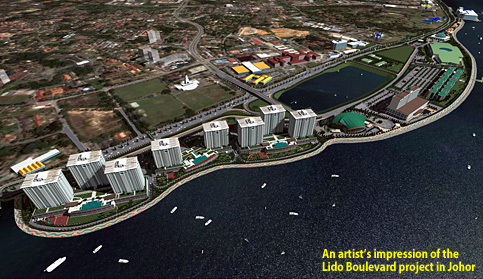 TAN Sri Vincent Tan's multi-billion ringgit beachfront project Lido Boulevard, thought to be abandoned, will start site mitigation works this week. It is estimated the entire development will have a gross development value of RM4 billion. Overlooking the Strait of Johor, Lido Boulevard is an integrated residential and commercial waterfront development that spans 2.4km along the Tebrau Strait coastal line. The development starts right after the abandoned JB Waterfront City, Lot One, and ends just before the Marine Department. Little has been heard of the project after a portion of land which had been reclaimed caved in, resulting in the loss of a life in November 2010. "We had to have a complete revamp after the whole incident. We took a bit more time to be more careful," Central Malaysian Properties Sdn Bhd (CMP) chief executive officer Khoo Boo Teng told Business Times recently. Post-clean up works, he said there was a need to revisit its design work for, among others, roadworks along Jalan Skudai, the closest point to the coastline. After a long and tedious process of submitting plans for approval, Khoo says after a fine-tuning of its masterplan, it is all systems go for mitigation works. This includes rigging out the sea area it will reclaim with silt curtains and sheet piles to ensure that waste and debris, once work starts, do not get into the straits. This procedure will take three to four months to complete. The project will comprise six parcels: Its high-end condominium towers Lido Residences, a 2.7km long and 10m wide boardwalk, a cultural centre, a hotel and retail mall, office suites and a 1.8ha to 2ha green lung. The development will stretch 450m into the strait from the coastline. The initial plans for a 50,000 sq ft snow park is still under consideration, says Khoo. The development blueprint is based on the theme of a garden city with heavily landscaped garden, water features, park-like facilities and pocket gardens. Reclamation work is expected to take about two years to complete. The project is being developed in a joint venture with the Johor State Secretary Inc, an investment holding company of the state government. Vincent Tan and Johor Crown Prince Tunku Ismail Ibrahim Sultan Ibrahim Iskandar are shareholders in CMP. PETALING JAYA: Gamuda Land Sdn Bhd, the property arm of Gamuda Bhd, has purchased 4.86-acre freehold land in Kelana Jaya for RM95mil. It intends to develop the commercial plot into a mixed project of retail and office suites for RM600mil. “The average selling price for the residential component is RM750 per sq ft while the retail shops are estimated at an average selling price of RM800 per sq ft.
“The planning and content of this development is anticipated to be revealed in early 2014,” said Gamuda Land managing director Chow Chee Wah. The site is located behind the Giant hypermarket, and in front of Dataran Glomac. Other notable developments within a 500m to 1km radius are the newly-opened Paradigm Mall, Parklane Commercial Hub, Zenith Corporate Park, Kelana Square, Kelana Centre Point and Tiara Kelana. The group's other projects included Bandar Botanic in southern Klang, Jade Hills in Kajang and Horizon Hills in Johor Baru. “Two significant developments which we have added to our recent portfolio are Madge Mansions in Jalan Ampang, Kuala Lumpur and The Robertson Suites in Pudu, Kuala Lumpur,” said Chow. For the nine months to April 30, Gamuda Land has recorded 30% increase in new property sales of RM1.3bil. Total unbilled sales remain at RM1.3bil. Kelana Jaya is the new hotspot in Petaling Jaya and has recently seen the influx of developers along the Lebuhraya Damansara-Puchong stretch. Property developers who have made inroads included Mah Sing Group Bhd, Glomac Bhd, WCT Engineering Bhd and the SIMA Group. With 1.7 million sq ft of retail space, the Paradigm Mall by WCT has so far achieved 90% occupancy rate and a blended rental rate of RM6. Hwang DBS said that occupancy rate could rise to 95% when a key retailer occupies 20,000 sq ft. The mall, which has a gross development value of RM500mil is part of a 12-acre RM1.4bil mixed development. The other components of the development would comprise office towers, serviced apartments and a 350-room hotel which would be developed over the next few years. Paradigm Mall is managed and operated by Jelas Puri Sdn Bhd, a subsidiary of WCT. Mah Sing's RM3.2bil neighbourhood development of Icon City sits on a 20-acre site of the former Matsushita factory. The Sima group's Parklane Commercial Hub@ Kelana Jaya on a nine-acre plot is nearing completion. With a gross development value of some RM300mil, Parklane consists of shopoffices, retail units and small office home office suites. KUALA LUMPUR: Property developer Malaysia Land Properties Sdn Bhd (Mayland), which is redeveloping Phoenix Plaza in Cheras, will benefit from connectivity with the planned MRT station in three years. "There will be a pedestrian bridge right across the road connecting the MRT station to the second level of our shopping mall," said Mayland retail general manager Michael Chee. Renamed Cheras Sentral, the Phoenix Plaza shopping complex is now undergoing a RM125 million transformation. Chee said the mall, with 500,000 sq ft of net lettable area, anticipates 85 per cent occupancy by the end of this year. Rent at the malls is expected to be between RM4.50 and RM5.00 per sq ft.
A strong tenant mix and strong support from existing strata title owners will see to mutual benefit, Chee told reporters after a tenancy signing ceremony with TGV Cinemas, Jaya Grocer, Celebrity Fitness, CYC World Mega Leisure World, Moon Palace Chinese Restaurant, K-Mix Karaoke and information technology company Dynamic Trial Sdn Bhd here yesterday. Phoenix Plaza, which opened in 1994, closed in 2005 due to accessibility problem and inexperienced management. Mayland, a company controlled by Tan Sri David Chiu, bought 85 per cent of the stratafied block of real estate in 2009 from Danaharta. Chee said apart form refurbishing it, Mayland plans on adding a hotel and car parks. The proposed hotel, which will carry the group's hotel brand - Silka or Dorsett - which will have about 300-odd rooms and is scheduled for opening early next year. 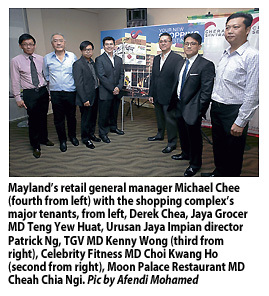 Mayland currently owns and operates the Sri Hartamas Shopping Centre. KUALA LUMPUR: Lembaga Tabung Haji is buying a 13-storey boutique office building in Bangsar South here for RM102.20mil from UOA Development Bhd. UOA Development said on Tuesday the purchase price for the one year old building was about RM700 per square foot based on gross area of 146,000 sq ft.
"The current book value is RM75mil. The proposed disposal is expected to generate an estimated gain on disposal of approximately RM20.86mil," it said. UOA Devt added the proposed sale of the building would enable it to realise the fair value of its investment property and enable the company to look for potential acquisition of investment property, which might provide better yield. "In the interim, the proceeds from the proposed disposal will be put into fixed deposit accounts with financial institutions," it said. New York City Mayor Michael Bloomberg on Monday launched a tender for the construction of "micro-apartments" in the Big Apple, where rents are exorbitant and the number of singles is on the rise. A pilot project slated for construction in Manhattan's Kips Bay section will feature rental apartments ranging from 275 to 300 square feet (26-28 square meters) with kitchens and bathrooms, the mayor's office said in a statement. Bloomberg explained it was "critical to the city's continued growth, future competitiveness and long-term economic success" to develop "housing that matches how New Yorkers live.
" "People from all over the world want to live in New York City, and we must develop a new, scalable housing model that is safe, affordable and innovative to meet their needs. "The project is slated to respond to the changing demographics of a city where 1.8 million households are composed of one or two people, but there are only one million studios and one-room apartments, the mayor's office said. Current standards in New York require that most new apartments be at least 400 square feet.But rental costs in the Big Apple are increasingly expensive. In Manhattan, a studio cost an average $2,243 per month in May in a building without concierge, up 7.9 percent from the previous year, and $2,657 in a building with concierge, up 4.4 percent, according to the Manhattan Rental Market Report. A one-room apartment cost about $2,959 without concierge, up 6.2 percent from 2011, and $3,777 with concierge, up 6.8 percent in a year.